The term pilgrimage is derived from the Latin, peregrinatio, which itself comes from per ager meaning “cross country”. Pilgrims step outside the regular routine of their lives. They move off the beaten path to make a journey to a sacred place in a personal search for meaning that will lead them within, to the source of their whole being. Why make a pilgrimage to Notre-Dame-de-Bon-Secours? Why, still today in the 21st century, join such an age-old movement? Why come to this chapel founded by Marguerite Bourgeoys where we have been preceded by the first Montrealers, sailors, Papal Zouaves, believers of every kind, anglophone and francophone and visitors to Old Montreal? 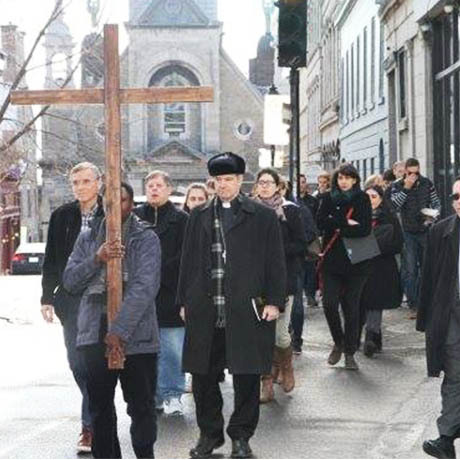 Pilgrimage to Notre-Dame-de-Bon-Secours Chapel had its origins in the devotion of Marguerite Bourgeoys to the Blessed Virgin and in the need to find a pilgrimage site safer than the cross on the mountain erected by Paul de Chomedey and the first Montrealers. Many of the objects in Notre-Dame-de-Bon-Secours Chapel bear witness to the different types of pilgrim. 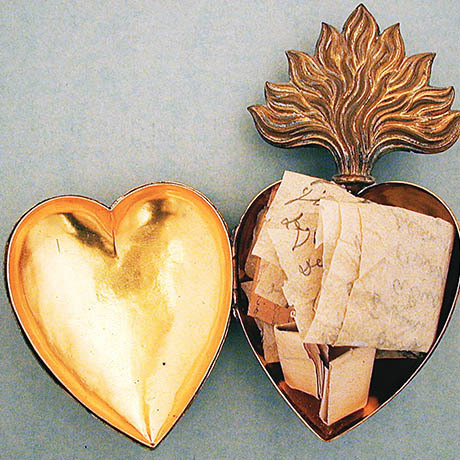 Some of the votive hearts hanging on the walls of the sanctuary recall the many groups of pilgrims who responded to the invitation of Ignace Bourget, second bishop of Montreal, in his desire to restore the tradition of pilgrimage to the chapel of Marguerite Bourgeoys. 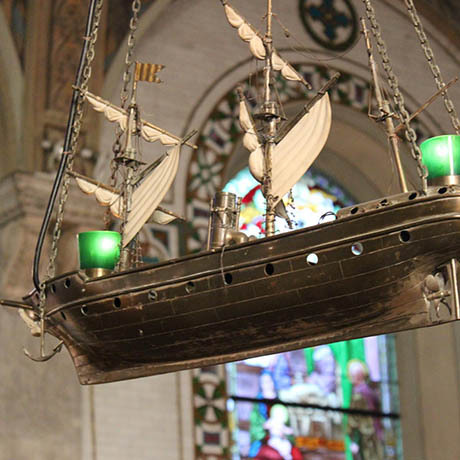 The model boats hanging from the ceiling evoke the attachment of sailors and longshoremen to the Chapel. The first recorded evidence of this devotion is the ship presented by the Papal Zouaves on May 26, 1872. These men from all over Canada wished to thank the Blessed Virgin for her protection on the voyage back to Canada after the Siege of Rome where they had defended Pope Pius IX. To this day, the Zouaves of Valleyfield come in pilgrimage each year on the third Sunday of September to commemorate the end of the Siege on September 20, 1870. Today's pilgrims are a diverse group. While many of them are believers seeking to deepen their faith, there are others who seek meaning for themselves and those close to them without being traditional believers. They are often persons who decide to take a break to recover a sense of their own deepest being. Pilgrimage then becomes a means of breaking old habits and starting out afresh of the road of life. Pilgrimage is first and foremost a meeting with the other, the unknown: the unknown that we meet along the way and that reminds us of our place in the human community; the unknown in us that calls us to assume our responsibilities toward every living being; and the transcendent unknown that reminds us that life will always have the last word and that we are simply called to do our best to improve this world of ours. Whoever you are, whatever your age, your situation, your needs, come and present your desires and your fears, your weaknesses and your troubles to Notre-Dame de Bon-Secours. Do not fear to ask too much; this good Mother has her hands full of grace, and she wants to distribute it. Her most ardent desire and sweetest joy is to find hearts ready to receive it. Open your soul to trust; Mary is the help of Christians. There is nothing that you cannot delight to obtain through her intercession. From the Manuel du pèlerin de Notre-Dame de Bon-Secours, 1848, by Felix Martin. S.J. We offer visits adapted to pilgrims.